Check out theses ladies as they dominate winter action sports and push the needle on strength training, sprinting, and conditioning and give us their workout. Picture yourself racing on a steep downhill track covering a distance of 400 to 600 meters in 45 to 60 seconds. Now imagine doing it wearing ice skates. 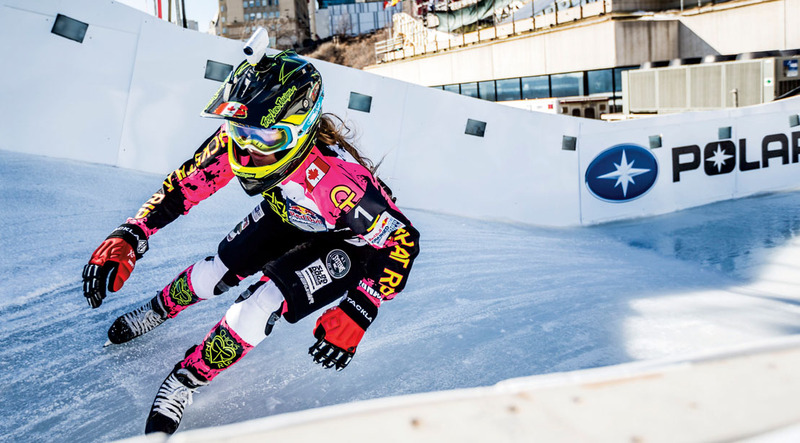 This is what the women in the sport of Ice Cross Downhill, aka “Crashed Ice,” do. Jacqueline Legere is the reigning women’s champion of the sport. The Canadian, who is just 25 years old, is already a Crashed Ice veteran, having competed for five years now. The season is made up of four or five Red Bull Crashed Ice events held in cities across the globe, plus a few Riders Cup races. “Our season finale is at the beginning of March  in Ottawa,” says Legere. Considering the risk involved, you may think injuries are a major concern, but Legere doesn’t let that stop her. “You have to make smart choices in practice and on the bigger features, but I just make sure I am trained properly,” she says. Legere’s training is demanding, and she starts to prepare for the upcoming season months in advance. “I work out five days a week in my basement gym or a CrossFit gym all year round. A few months before the season begins I start skating every day,” says Legere. Her training mainly focuses on sprints, transitions, and strength.